250 pages | 7 B/W Illus. The continuous expansion of the European Union has transformed its very own self-conception. While Eastern enlargement was widely celebrated as the ‘reuniting of Europe’, the sheer number of applicants, their low economic development and the need for new states to transform in accordance with EU values required considerable adjustments to the EU’s self-image. By examining the European Council’s contentious approval of the Mediterranean and Central and Eastern European countries in the 1970s and 1990s, this book investigates why the European Union enlarges. 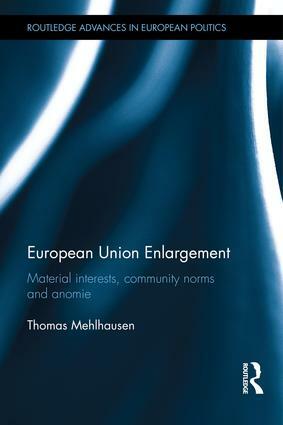 Based on new and hitherto not analysed data, it introduces the concept of ‘anomie’ to the discourse and, in doing so, makes a timely contribution to the literature of constitutional politics and enlargement of the European Union. This text will be of key interest to scholars and students of the European Union, area studies (European studies, central and east European studies, Mediterranean studies) and more broadly comparative politics and constitutional politics. Thomas Mehlhausen is a Research and Teaching Assistant in the Department of Political Theory at the University of Potsdam, Germany.